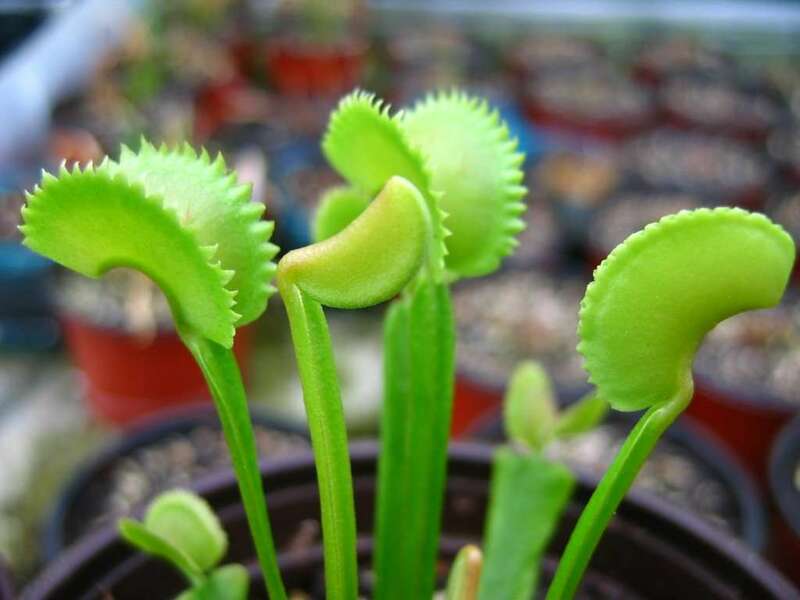 Dentate Venus flytrap cultivars are known for fuzed teeth which appear shorter and more triangular than normal flytrap teeth. The word “dentate” (den·tate/’dentat/adjective) means having a toothlike or serrated edge. 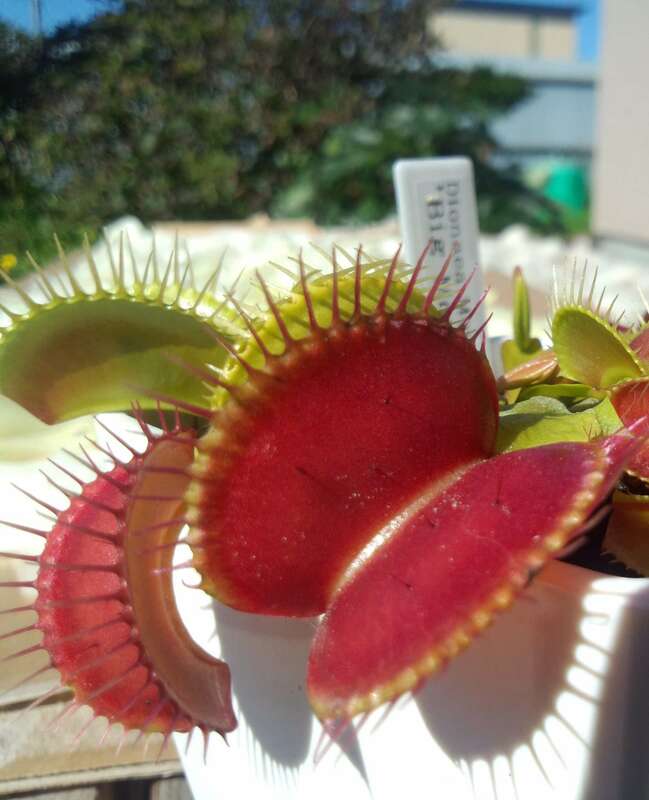 – A perfect name for this unique variety of Dionaea muscipula. 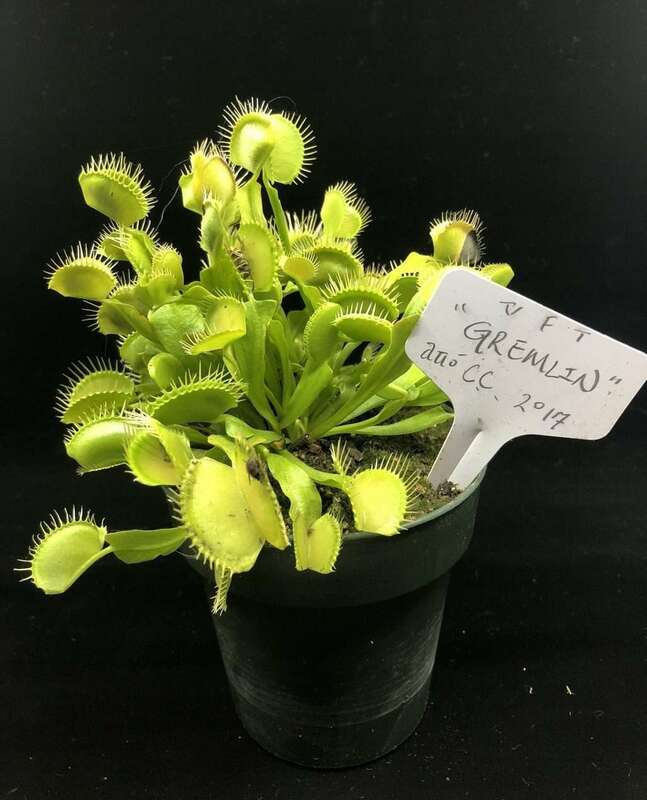 There are multiple varieties of this cultivar – Dionaea Jaws, Dionaea Dente, Dionaea Red Piranha, and Dionaea Sawtooh, and all of them originate from a laboratory – the result of mutations accumulated en vitro, or during tissue culture cloning. Looking like a gaping bear trap, the trap of a Venus flytrap Dentate has an unmistakable appearance. Traps can be pure green, or deep red in bright sunlight are medium-sized, and hang from upright petioles. 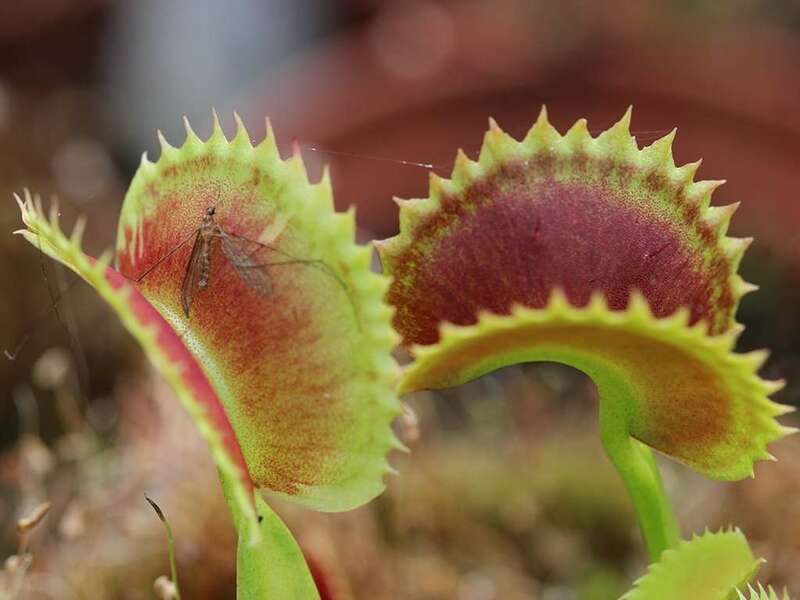 Luring and trapping mechanisms are the same as any other “normal” Venus flytrap with the one distinct characteristic that smaller insects have a harder time escaping this trap due to the lack of gaps between the closed teeth. 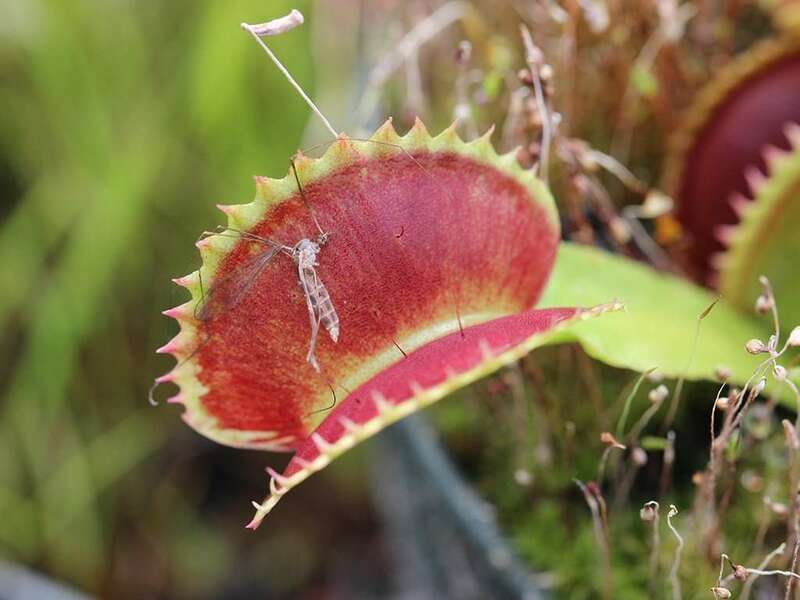 This could be viewed as a biological disadvantage as the plant can experience a net loss in energy and nutrients as it attempts to digest small prey. 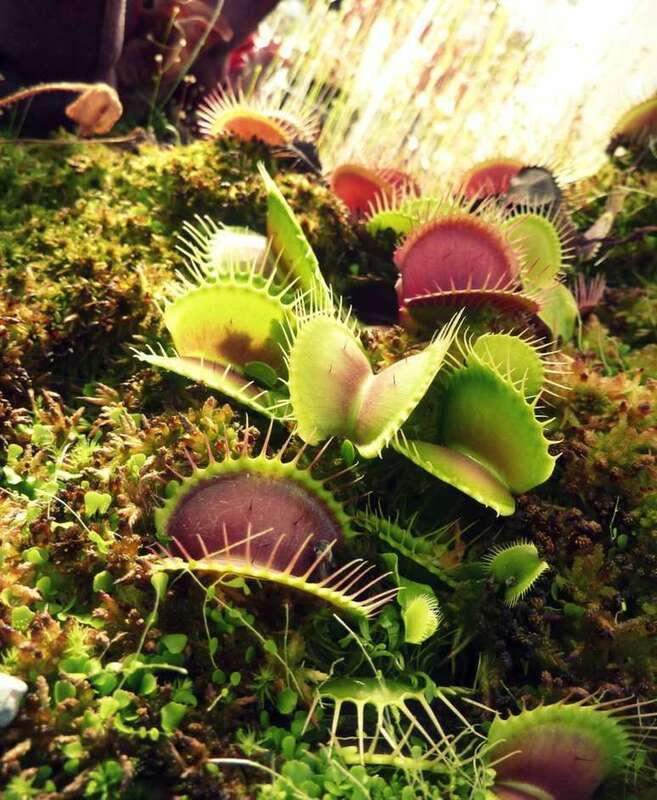 There are numerous varieties of Dentate flytraps. If we’re missing one, please submit additional varieties for us to include. Below varieties correlate with the plant images above. 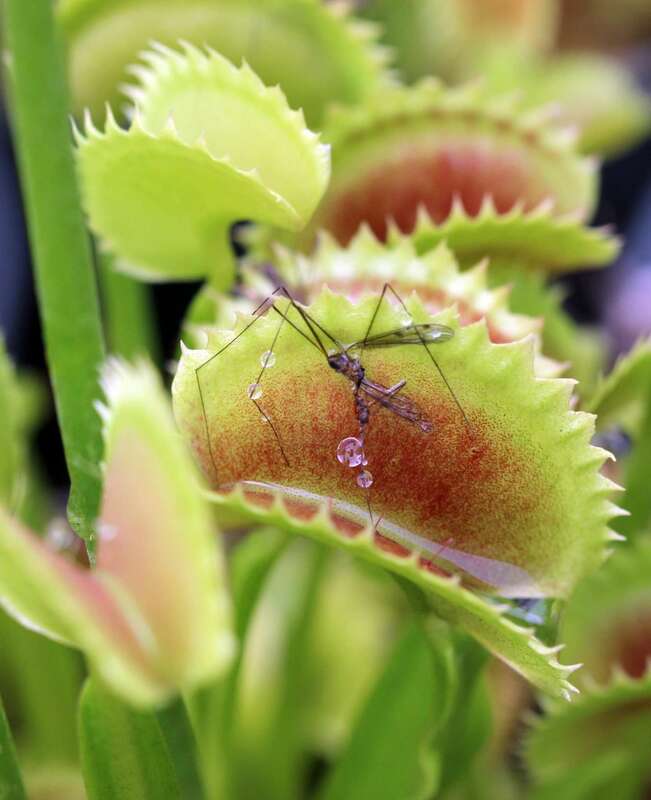 Dionaea muscipula ‘Jaws’ is a monster dentate Venus flytrap form with large traps that like to hug the ground, particularly later in the season. Trap interiors are deep red and the color wraps around to the exterior surfaces of the teeth. 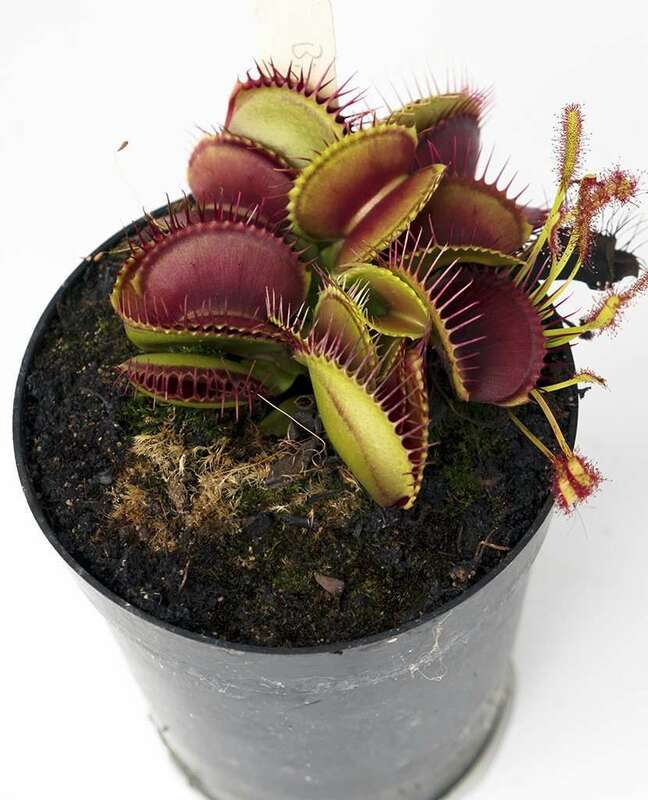 Traps on Dente flytraps have deep red interiors, medium-sized traps, and shorter, upright petioles. 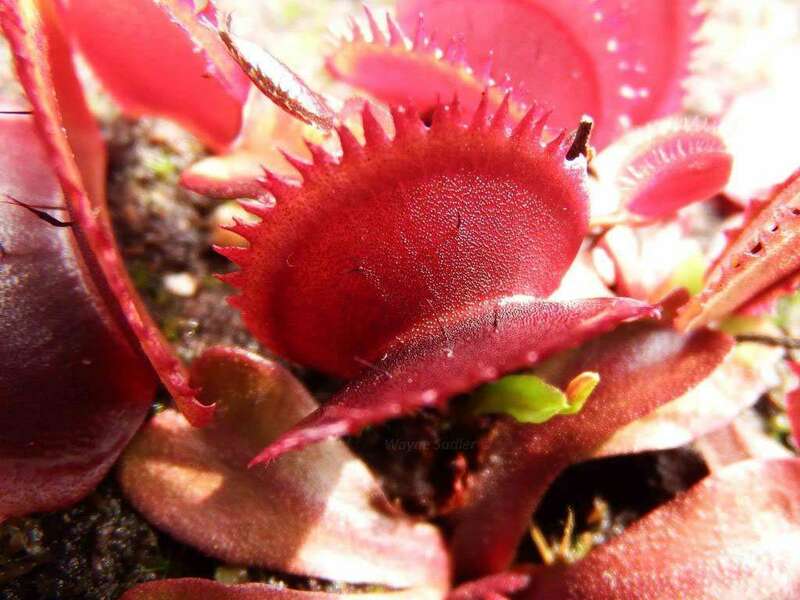 The Red Piranha flytrap is a hybrid clone of ‘Red Dragon’ x ‘Dente’. The entire plant is deep red, and teeth are short and jagged. 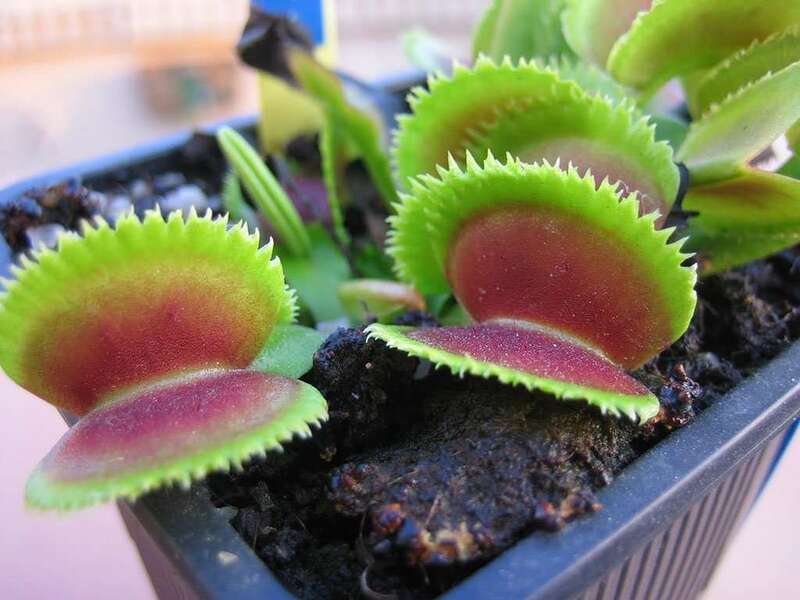 The Sawtooth flytrap has particularly stumpy teeth that can be irregular and extra jagged. 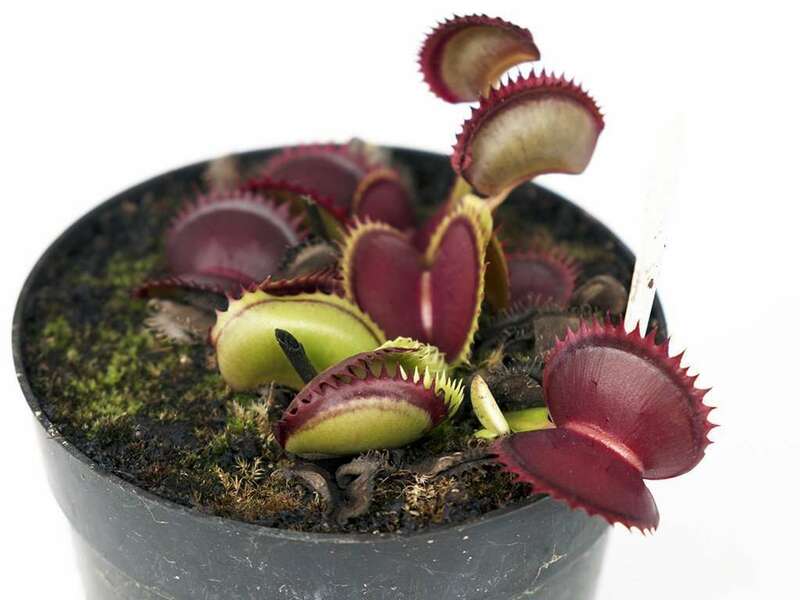 As the name suggests, this Venus flytrap cultivar divides like gangbusters! It's definitely one mogwai you'll want to give water and feed after midnight because mo' 'Gremlin' Venus flytraps are mo' better. Sometimes a name says it all. This Venus flytrap produces large, red-mouthed traps that cluster at ground level like a bouquet of death. 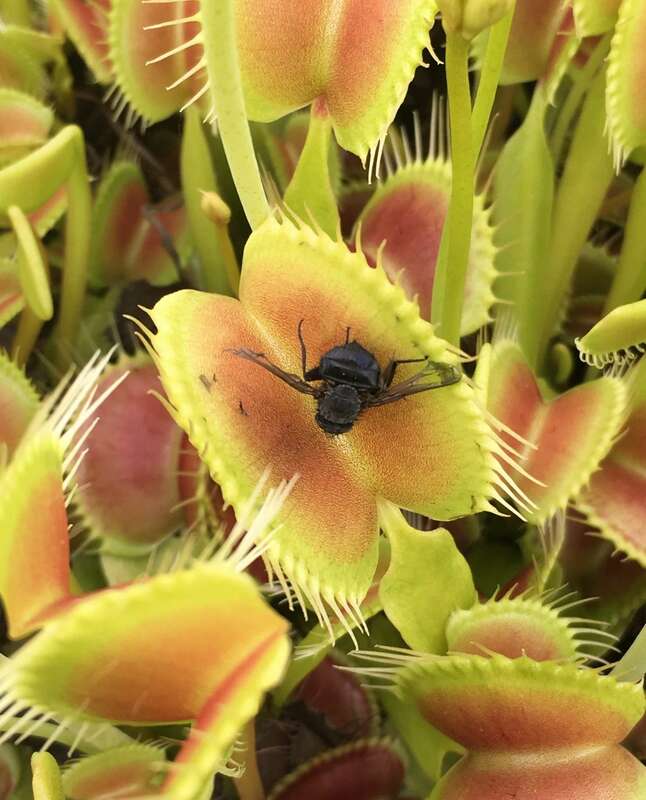 Not named for the massive B-52 bomber, but might as well be, the B-52 flytrap is a massive traps surpassing 2 inches in length.